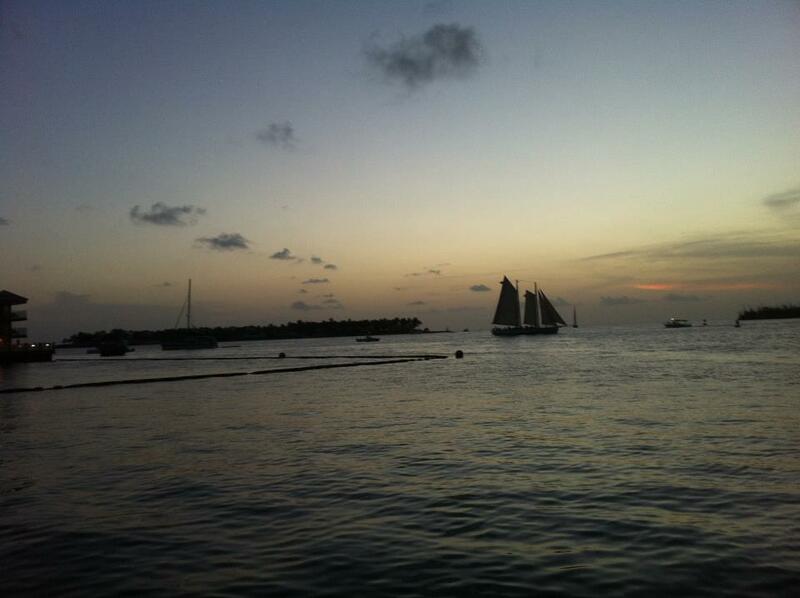 Sunset over the water, from a dock in Key West. I spent this past Wednesday through Sunday in Florida, experiencing the “good life,” as best as I have in a while. I’ll write a post about Florida soon—about Hemingway’s house in Key West and the 44 six-toed cats that wander the property; about the five-bar pub crawl where I actually attempted to write drunk, and ended up scrawling indecipherable gibberish in my notebook; about the storm clouds that purpled the sky over the pale sands of Miami Beach; and about watching fireworks burst in clusters of star-flame while walking barefoot in the wet sand on the edge of the ocean. I’m waxing poetic, so I’ll stop. But it was wonderful—I haven’t been that happy in a while. Do you prefer a drink or a cognac? Hem would opt for the latter. 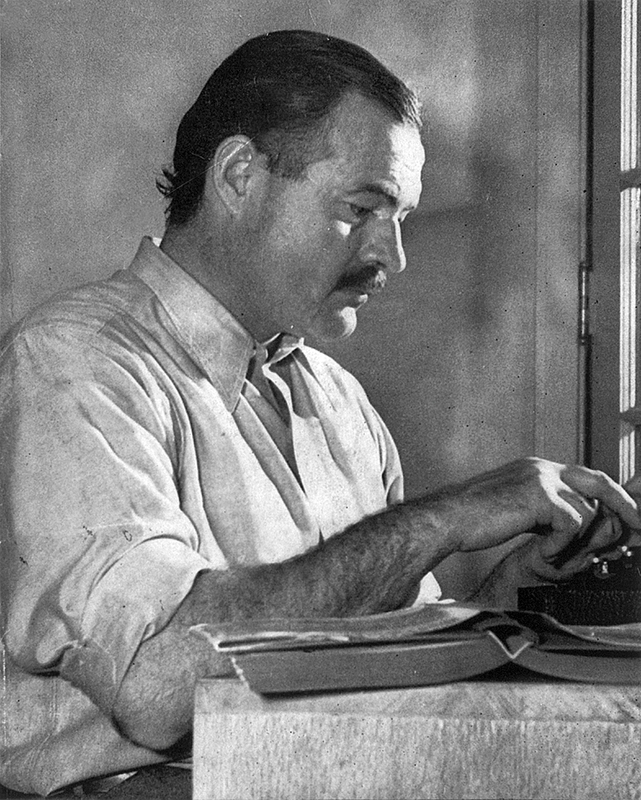 “They had a vermouth…” is an excerpt from a book review by Andrew O’Hagan, originally published in the London Review of Books, covering The Letters of Ernest Hemingway: Vol. I, 1907-22 , edited by Sandra Spanier and Robert Trogdon. We’ll start with the excerpt about drinking and move onto Papa’s notorious self-aggrandizement. O’Hagan begins his review by poking fun at Hemingway for his “engorged nouns”: in A Farewell to Arms, the protagonist Frederic Henry gets continually sloshed, but never by simply “having a drink.” Instead he guzzles grappa, chugs chianti, quaffs cognac, and downs a number of other libations: vermouth, brandy, marsala, dry white capri—you get the point. So Hemingway liked nouns…and loved drinking. Write about what you know, right? Here’s where I have to agree with Hemingway on the side of specificity. I’m not an expert, but I do know enough from experience to say that reaching a BAC of .08 g/dl (the point at which you are legally intoxicated in the US) feels different depending on what you’re drinking. Red wine vs. beer vs. vodka, for example. Red wine makes you feel woozy, philosophical, and wise. Beer makes you question whether you’re drunk at all. There are bees buzzing in your head, your arms are light and springy, and gosh, isn’t it a fantastic day? Yeah it is! Vodka, though…that stuff if dangerous. Vodka makes you psychotic. I knew a guy when I lived in New Orleans, last summer, who was such a connoisseur of wine that he knew which grape variety he’d avoid at all costs. We had Cabernet Sauvignon instead, and I’ve steered clear of Pinot ever since. So I don’t blame Hemingway. Not at all. He was right to distinguish between liquors. It’s the duty of a writer to describe feelings accurately: for an expert drinker like Hemingway, that meant describing the exact beverage that, in a given circumstance, would bring on a certain emotion. That’s detail. Now let’s talk about Hemingway’s embellishments, which O’Hagan discusses in his full-length review. To point out the obvious: the world is fascinated by Hemingway because he was a “man’s man.” Unlike the thoughtful and timid writer who holes away in a quiet study and trembles before the microphone at a reading, Hemingway was loud and arrogant and big. 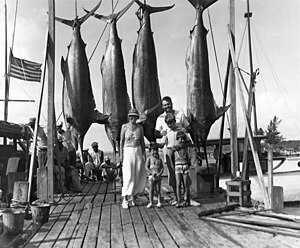 He shot big things and fished big things and did big things. He was also a terrific writer. He took the flowery prose of his time and chopped off the petals. He mastered the art of subtlety, sleek sentences, and deep feeling. He was so greatly skilled in his profession that in the end he created the biggest fiction of all: himself. But that’s not really accurate, either. At what point do we stop becoming phonies and start becoming real? How do you determine authenticity? Is it wrong, to continually try to better yourself? Hemingway was like a real-life version of Pinocchio, stomping around the world and trying to convince himself of his own bravado. “I’m a real boy!” Pinocchio cheers. “I’m a real man,” Hemingway grunts. But he was, in many ways. By continually seeking to be the best, he became the best. Look at his fiction. If we can admire a writer for always trying to write better prose, then why not admire Hemingway himself, for always trying to be a better Hemingway? In the end, he became what he had always wanted to be: a giant. Perhaps what he had not expected, though, was the incredible isolation that would come with it. Or perhaps he’d carried that within him all along.